You know you have a problem because you’re running out of space. You can’t find anything, you’ve got stuff everywhere, and the chaos is driving you out of your mind. You know you’ve got too many things, but how do you identify which things to keep and which are clutter? 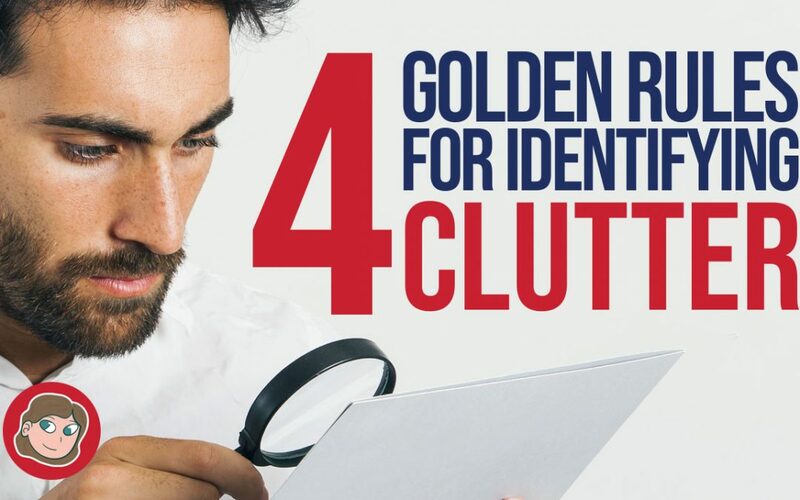 Identifying clutter is not as hard as it seems if you remember my four golden rules. Rule 1 Do You Use It? This is the first and most important rule. If we separated out everything that we actually used, then it would be quite a small pile wouldn’t it? If we just got rid of the huge pile that was left then we would be rid of our clutter problem quite quickly! But before we take quite such drastic action we need to scrutinize the pile first. That’s where the next three rules apply. Rule 2 Does It Have Sentimental Value? If you don’t use an item but it makes you feel all warm and gooey inside when you look at it, then it’s probably a keeper. Family photos, letters or your very first baby toy, are examples of things which are not clutter, even though you may not use them. But be selective here, don’t keep everything; just keep a few special items in a photo album (full disclosure: affiliate link) or box. Rule 3 Will It Be Useful One Day? The third rule is where you need to apply some realism. I would say that in most cases the answer is probably not! You may not use the item because your lifestyle has changed. For example if you have a young family and you don’t have the time or the money available to go skiing any more, then it makes sense to sell those skis. If you have an old fashioned turn-table that you don’t use because you have a CD player or listen to your Apple iPod, (full disclosure: affiliate link) then it makes sense to let it go. Nobody is making those vinyl records any more and you can always get them converted to MP3 files! Use your common sense here. It’s your life and you know who you are and what you enjoy doing. Remember, all those unused possessions are becoming dusty, musty and out of date whilst they are lying around in waiting. Rule 4 Do You Actually Have Room For It? That six foot cardboard cut out of Darth Vader which you acquired when you were a student and gives you a fright every time you enter the room, may not fit into your current home! So the final rule is; do you actually have room for it? Darth may be taking up valuable space and apart from keeping you on your toes, isn’t giving you much in return. It’s time to use the force and get rid of Darth. Do you have room for that running machine that is taking up so much space in your study? You bought it on an impulse, but the only exercise it gives you is when you dodge past it on your way out of the door! You are not the person you used to be and your possessions may no longer suit the new you. As you grow through life your needs change. So keep around you only those things which enhance and assist the person you are today. Remember my four golden rules and identifying the clutter in your life should be a lot easier from now on. Start today and ask yourself are you using that item sitting next to you right now?